Luke Wright has stepped down as Sussex Cricket captain with immediate effect. The 32 year-old batsman, who has been with the club since joining from Leicestershire in 2004, originally took over as NatWest T20 Blast captain for Sussex ahead of the 2015 season, which was also his Benefit Year at Hove. He then took over the captaincy across all three formats of the game in 2016, following Ed Joyce's decision to end his own reign as skipper. He has now decided to step down as Sussex captain, with the side having played four Specsavers County Championship matches so far this summer, as well as the Royal London One-Day Cup campaign, which the Sharks narrowly missed out on a quarter-final berth. Wright said: “Firstly, I would like to thank Sussex for the privilege and honour of being made captain of this fantastic club. “I have always been someone that loves and enjoys the game, but over a period of time now whilst being captain, this has not been the case and it has affected me both on and off the pitch. “After taking some time I decided that stepping down was in mine and the club's best interests going forward. Sussex's director of cricket Keith Greenfield said: “Luke has made this decision with the best interests of himself, his young family and the team, and we thank him for all of his efforts while captaining the club. It is an all-encompassing position, particularly whilst rebuilding the team. “Luke plays his best when enjoying his cricket and playing in an attacking manner. We all want to see Luke play with a smile on his face and enjoying his cricket. Head Coach Mark Davis said: “I would like to thank Luke for everything he has done for the team in his role as captain. I have thoroughly enjoyed working with Luke and establishing a new-look Sussex team that will bring success back to our great club. 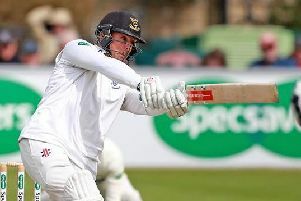 Chris Nash will lead the team for tomorrow’s Specsavers County Championship match with Worcestershire.